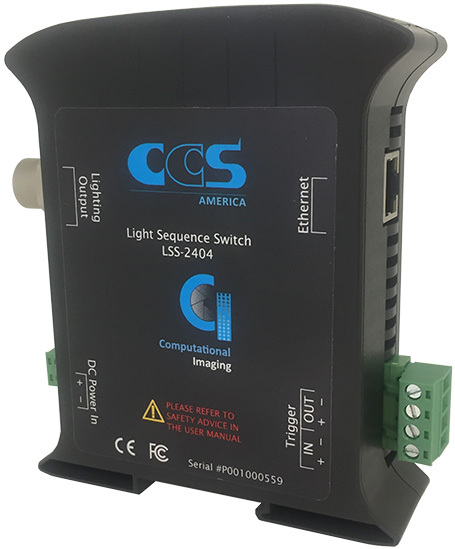 The LSS-2404 Light Sequencing Switch is designed to be the heart of any computational imaging system and can switch external +24 VDC power for up to 4-channels of lights. Upon receiving an external system trigger, the LSS-2404 executes a pre-programmed sequence of lighting on the 4-channels and outputs a correlated camera trigger, automatically timing an external camera exposure to the programmed lighting sequence. May be set-up as master or slave in a system. 10.8 – 28.8 VDC (absolute range); suitable for either 12 V or 24 V DC lighting. 5W maximum internal dissipation; excluding attached lighting and dependent on configuration. Switched Ground Mode: Use opto-isolators or closed contacts via direct connection without external components. 1A/ch x 4-channels; 4 A maximum all channels. RJ45 connector. 100BaseT Ethernet. TCP/IP protocol. Control via web-based GUI or TCP/IP command set. User upgradeable via GUI (included). User programmable via GUI (included). Copyright © 2019 CCS Inc. All Rights Reserved. "Computational Imaging" logo and "Get the image you need" are trademarks of CCS, Inc.